Are you drawn to the idea of splitting big meeting rooms into spaces where you can gather ideas on a (literal) blank slate? Then check out our whiteboard wall panels, as they’re portable, moveable, and durable. One entire side can be written on with dry-erase markers. These simple and elegant whiteboard room dividers can be used in a variety of scenarios: creating classrooms, school art displays, business meeting rooms, and uniquely entertaining or collaborative spaces. 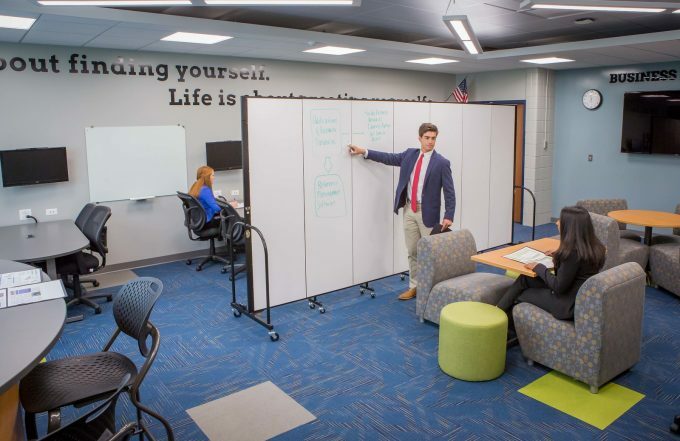 See how just one whiteboard partition can help you suddenly transform a space into a think tank for students, visitors, or employees. Customize your Screenflex partitions so that one or more of the panels function as a dry-erase board. Note that should you already own Screenflex partitions, we also offer the opportunity to create one focal point with a hanging dry-erase board addition. Consider the options when buying folding accordion dividers; dry-erase panels are mostly for those hoping to create a space where it’s safe to explore concepts and brainstorm ideas. Use the convenience of rolling, a freestanding whiteboard wall to inspire the creativity of everyone in your area. 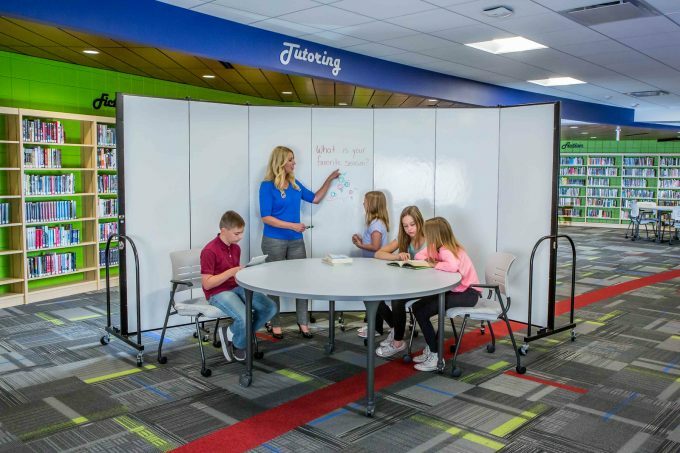 A favorite and frequently used function of these whiteboard room dividers are to create more interactive classroom space in elementary schools and middle schools. Where room is very tight, it’s hard not to lose the attention of students. Thankfully, dry-erase boards like these provide interactive spaces, which have been proven to make classrooms across the U.S. more effective. Whether you plan to encourage children to practice spelling, show off their math skills for the class, learn faster with a teacher’s detailed notes, or simply draw and doodle in their free time, a whiteboard partition is the way to go. Business conventions, crowded meeting places, and rooms with only cubicles all can be broken down with the flexibility of Screenflex’s room separators. Create new temporary office spaces for more effective collaboration; none of our products can do that quite like our whiteboard partition! Business professionals and managers at numerous companies often rely on the creative magic of whiteboard walls to help them brainstorm and discuss ideas in teams. Even if you might not have the extra long-term conference rooms and meeting areas for teams to gather and discuss, you can always create them on the fly with a rolling partition. With it, employees can use their brainstorming techniques on the blank, white surface to solve problems. There are even more problems that a rolling whiteboard partition can solve, but in all cases, a simple partition can create a temporary space that encourages occupants to interact, record, collaborate, and show off their ideas. The versatility of a whiteboard is possibly why so many of our customers choose to add one or more dry-erase panels to our room dividers. Buy one of these products today if you want to revolutionize your space into a dynamic one. Remember that you can always customize your product to your exact specifications. To learn more, contact us online today!